Waterproof breathable fabrics work to keep you and your layering system dry while allowing perspiration to exit during exertion. Waterproof breathables typically offered in 2-3 layer fabrics, all of which are all built upon the same principle: the pores of these fabrics are too small for water to get through, but large enough for body vapor to escape. To attain their waterproof breathable properties, fabric makers utilize either laminate technology or coatings. Laminates are formed when waterproof breathable membranes are bonded directly to the underside garment’s face fabric. An analogy for this process is the idea of wallpaper applied to a wall. Where the membrane (wallpaper) + fabric (wall) = a laminate. Coatings are liquid solutions that provide waterproof breathable characteristics when applied to the face of the garment, similar to paint applied to a wall. All raingear face fabrics are treated with durable water repellent (DWR) finishes to provide extra water protection. Waterproof breathables commonly consist of an outer layer known as a face fabric (usually made of nylon or polyester) and a laminated membrane or coating made of ePTFE or PU. A third layer consisting of a backer lining is sometimes added to provide abrasion resistance. The purpose of the face fabric is to add color and protection. Although this layer is treated with a durable water repellant (DWR), it is not waterproof. The second layer , the membrane, which has tiny holes too small to let liquid water enter, but large enough to allow water vapor to escape, is the waterproof layer. The last layer in 3 layer fabrics is bonded for comfort. Over the years most waterproof breathable fabrics are all extremely waterproof for any weather activities, but differ in breathability and other dimensions. The core of a laminate is its waterproof membrane. In laminates, the membrane is bonded to the fabric by applying pressure and heat. Membranes are most commonly made from expanded polytetrafluoroethylene or polyurethane films. ePTFE waterproof membranes have microscopic web-like structures that are only about 10 microns thick. Makers of Gore-Tex® have estimated that one square centimeter of ePTFE contains 1.4 billion pores. The pores in ePTFE are about 20,000 times smaller than raindrops making ePTFE hydrophobic (water repellent). An ePTFE membrane is a low surface energy solid. That means the individual atoms of the membrane are tightly bound to one another. A low surface energy solid will only get wet when it comes into contact by a low surface energy liquid. Water has a high surface energy; atoms in water, while still bound, are not bounded to the same magnitude as low surface energy liquids. When a liquid has high surface energy, molecules tend to pull together in a shape that occupies the least amount of space on other surfaces. So when high surface energy water, makes contact with low surface energy ePTFE, water molecules bond tightly together into round droplets that slide off the surface instead of penetrating through. There are only two ways that water can penetrate ePTFE- if water is applied with enough force or if the ePTFE membrane is contaminated. Rain during windy seasons exerts a force of about 2 pounds per square inch, which is not strong enough to penetrate ePTFE. Any high surface energy materials can cause contamination: dirt, body oils, sweat, or pesticides. When the membrane is contaminated, the composition of the membrane is altered, causing its surface energy to change. If water molecules come into contact with a high-energy surface, they split open and wet the surface of the material causing leakage. The only way to prevent ePTFE from contamination is to make it oleophobic (resistant to oils). It is hard to discuss waterproof breathable laminates without mentioning Gore-Tex®. Robert W. Gore discovered that ePTFE could be manipulated into a nearly weightless film, thinner than a trashcan liner. This membrane contained billions of microscopic pores that turned out to be so small, water droplets couldn’t fit through, but water vapor-that is released from the body when you sweat- could. Thus, the creation of waterproof breathables. Today, Gore-Tex® creates its fabrics by laminating their ePTFE membrane directly to a high performance face fabric. While Gore-Tex® was struggling with a membrane design that better allowed moisture to escape, eVent™ was created. The eVent™ membrane is formed from ePTFE just like Gore-Tex, but without an added polyurethane film. eVent™ injects the ePTFE membrane with polyacrylate to make it more breathable, but according to fabric experts, less durable. eVent™ fabric maintains your body’s temperature and stays protected from contaminants. Since eVent™ infuses protective ingredients into the membrane, unlike Gore-Tex, that glues a separate layer onto the membrane, eVent™ fabrics have a unique waterproof membrane that allows millions of tiny pores to breathe while being too small for water to soak through. In cold, dry weather, a super breathable shell can actually lead to visible clouds of water vapor exiting the wearer’s body, which leads to heat loss. It is not uncommon for owners of eVent™ jackets, for instance, to need more insulation under their shells to stay warm. Polyurethane (PU) laminates are made by laminating a lightweight polyester fabric or 100% woven fabric to a thin film of polyurethane of about one to two millimeters thick. Once weaved together this creates a flexible and breathable water-resistant fabric. Using a thinner laminate helps keep the fabric as stretchy and soft as possible. PU films allow for good stretch, complete waterproofing, and maximum comfort. As compared to ePTFE, PU films usually result in lighter, smaller-packing garments. PU laminates, unlike ePTFE laminates, can accommodate stretch in a garment’s design and are highly durable. Therefore, these lower cost PU films, may handle hard impacts such as falls better than ePTFE laminates. PU laminates tend to have many characteristics that set them apart from other waterproof breathable laminates. Some of these general characteristics are long-term durability, flexibility. Additionally, PU laminates are abrasion and oil resistant. Tensile strength measures the stress a material can withhold before breaking while being stretched. The tensile strength of PU laminates can range from 5800 to 9506 psi (pounds per square inch) while the tensile strength of other laminates is around 4000. PU laminates can elongate 800% before breaking compared to the 300% of other laminates. PU laminates possess application flexibility, which means they can be transformed and altered while still retaining flexibility and performance. These laminates remain flexible in temperatures as low as -60°F, which makes them the perfect material for demanding environments. Coatings consist of spreading a layer of polyurethane resin directly onto the fabric. There are two mechanisms to make coated fabrics, microporous or monolithic. 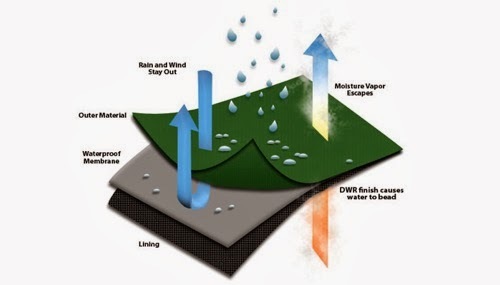 Microporous coatings have very small pores that are big enough to allow vapor to pass through, but smaller than a raindrop. This means that perspiration from your skin can easily pass through the fabric, yet raindrops are way too large to soak into the garment. The diameter of microporous coatings range from 0.1 to 1.0 micrometers, a raindrop’s diameter is larger than 3.0 micrometers, but the diameter of vapor is about 0.0004 micrometers. Monolithic coating is a solid nonporous coating that protects from the wind and will not clog with dirt, detergent, perspiration or dirty water like a microporous coating might. This hydrophyllic coating pulls perspiration off skin, then absorbs the perspiration vapor and disperses it through the fabric, allowing it to be evaporated away from the fabric. Fabrics with coatings and lamination have about the same level of durability, but coatings come off gradually while delamination (the separation of laminated layers of fabric), once begun, happens more rapidly. The terms waterproof, water resistance, wind resistance, and breathability refer to specific conditions that have been tested for in a laboratory. Products are usually given two ratings, the first is a measure of how waterproof a fabric is and the second of how breathable the fabric is. When comparing measurements it is important to make sure you are comparing measurements with the same scale. In order to be waterproof by definition, a fabric is only required to withstand over 1,000 mm of water pressure without leaking; therefore, it is important to learn the ratings. Water resistance is measured by the pressure of water, in millimeters (mm), that can be kept out of the fabric for a 24-hour period of time. Once a fabric is rated at least 20,000 mm/24hr it is completely waterproof. One of the problems with breathability measurements is that there is no universally accepted standard. Therefore, when comparing breathability measurements consumers may not be aware that they are not comparing equal measurements. One frequent measurement for breathability, however, is the grams of water that can move through a square meter of fabric over a 24 hr period (g/m²/24hr). Below are the ratings of waterproof products compared to others on the market.